Simply served, spinach is wonderful sautéd or in a salad, but it has infinite possibilities in the kitchen. 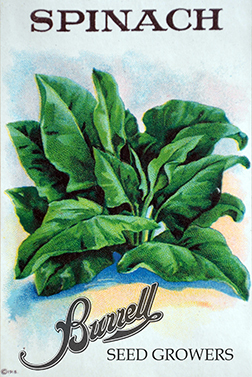 Touted by Popeye as a superfood in the 1930’s, 40’s and 50’s, spinach has long enjoyed a reputation as a healthy green. Welcome at any meal, spinach quiche and omelettes at breakfast, start the day nicely. For lunch, a spinach, bacon, apple and feta salad dressed with a champagne vinaigrette or creamy spinach soup. As an appetizer, oysters Rockefeller or spinach artichoke dip. For dinner, spinach pizza, pasta or sole Florentine. Why grow a little spinach when there are so many ways to enjoy it? Grow lots and keep planting throughout the year. It can be planted late in the year and winter over for an early spring crop even at 9,400 feet in altitude. A cool weather crop, direct seed spinach before the last heavy snows of spring. The melting snow will give it the moisture to germinate. Sprinkle on top of a loamy soil and the snow will push it in. In my high altitude garden, I continued sowing spinach seed from early spring until late fall, using it as a ground cover between larger plants. All my gardens had spinach growing in them. In warm climates, direct seed early and late in the season. 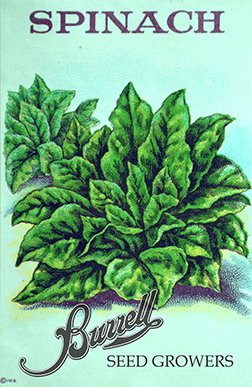 When the weather warms it will bolt, although Bloomsdale Long Standing spinach does hold up to its’ reputation. Hot areas can only grow this lovely green in the winter. While it works well in a cut-and-come-again salad garden, seeds can be planted 1/2″ to 1″ deep, 6″ apart in a row. Harvest when little or wait for larger leaves to blanch and freeze. Good companion crops are brassicas, celery, corn, eggplant, peas and strawberries. In warm climates, direct seed early and late in the season. 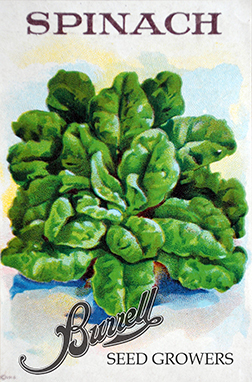 When the weather warms it will bolt, although Bloomsdale Long Standing spinach does hold up to its’ reputation. Hot areas can only grow this lovely green in the winter. While it works well in a cut-and-come-again salad garden, plants can be thinned to 6″ apart in a row. Harvest when little or wait for larger leaves to blanch and freeze.